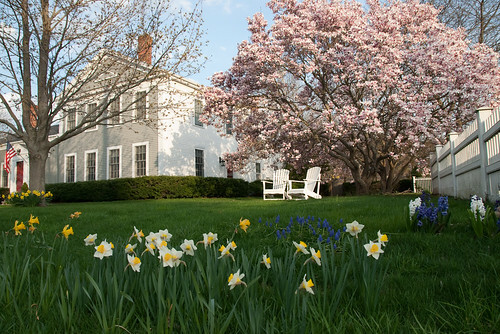 Spring is my absolute favorite season, and I always feel like it truly is here when we celebrate Brewster in Bloom festivities in our lovely Cape Cod bayside town of Brewster. We have been innkeepers for 5 plus years at our Cape Cod Bed and Breakfast and are simply amazed at how beautiful nature is here on Cape Cod. The whales are back and can be seen at the whale watching tours in Provincetown, the herring are running at the grist mill here in Brewster, and the national seashore has so many stunning beaches to walk on this time of year. On our property the daffodils and tulips are in full bloom, the magnolia and cherry trees are stunning and I am anxious to get into our vegetable garden to start planting seeds.